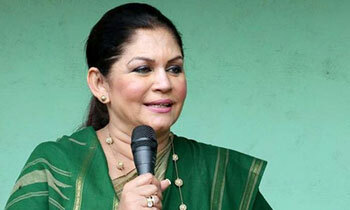 Rosy Senanayake, who has become the first Mayoress of Colombo, yesterday said she is prepared to face any challenge that would come her way. "People talk about challenges when women were coming in for politics at this election but women also can take up any challenge a man can face, " Ms. Senanayake told Daily Mirror last afternoon. Accordingly, Ms. Senanayake said she would take up the challenge of eradicating corruption and making Colombo a smart city. She said she would work with all members of the council. She further said she would start up with a three month delivery programme and then a six month programme and a one year programme. "This is not going to be a one like the 100 day programme as it will be a serious programme three moths to one year, " she exclaimed. She also said her ward is a predominantly Sinhalese one but thanked all voters belonging to all ethnic and religious groups. Congratulations Madam! We already knew the result before hand. I praise you for your courage. It is a rejection of the people in apathy and rejection if the government has lived up to the promises for the mandate it obtained last time with efforts to bring back the plundered wealth of the country the people would have believed but instead what they saw the backbone central bank scam through which the high ups and cronies swindled as usually the predecessors. people's verdicts the better the already known devils. OK Rosy. Let's see You have a lot to prove and some damn hard work ahead of you.This really is your last chance, as well as that of the party. Well done. You seems to have a vision and how practical and effective is a question of the time. We all hope your plans are not like your leaders unrealistic dreams and you will bring up the proud of the city back after GR's remarkable face lift which your government neglected after. Congratulations Rosy on being the the 1st woman mayoress. Make us women proud and bring the city of Colombo and the grand old party back to its former glory. Congradulations mam. Be firm and strong. Don't allow the crooked and spineless leaders (everyone know who they are) to control you. Divine blessings to you. Congratulations, see when God closes a window he opens up a door.Pls ensure the Garbage gets collected on time to keep the city clean and talk to the Education Minister and bring this in the curriculum to educate the children.God Bless. Oh really, typical political talk, Wait and see, nothing happens at the end. We have been cheated like this for the past so many years. Corrupt MR regime got a boost because of your govt's inability to bring them to law. What are you gonna do with CMC ? We saw your finger prints in the bond scam as well though you denied all. MR denied all allegations as well. I will give you one advise! don't let your relatives rule you or advise you what to do and give them any kind of post in the municipality. Colombo is a vast area and within the municipality corruptions can occur and don't let that happen, first and form-est clear these corruptions in tenders etc. Show your ability and don't let others rule you. you rule others. We will be vigilant and will be keeping our eyes open. I doubt she could do much as compared to what Gota did during the last government. If she could achieve the least having the garbage collected and keeping the road clean - good for starters. Only person who can be happy despite Party's debacle ! Congrats' Your Worship, the Major! You are creating history in thé country becoming the first lady Major. First get rid of the garbage in Colombo and areas just outside Colombo. Philanthropists and well wishes will give money to keep the city clean. We will rally round you to keep the city clean and free from dengue. You were the one time most beautiful woman in the world. You can keep colombo clean and beautiful. I was critical of you we will give u chance to prove your worthiness. All the best. Congratulations ma'am. Being a woman With elegence, decency and knowledge i hope you will do a great job and fullfil all the duties in a rightful manner. good luck! !